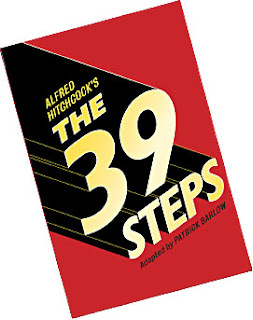 Patrick Barlow's pastiche adaptation of famed thriller The 39 Steps has been critically lauded and won a 2007 Olivier Award for Best New Comedy. So it was not great hardship when I bought the Missus tickets to go see it for her birthday as I was also looking forward to having a look and a good laugh. I'm also a long-time fan of Barlow's other incarnation as the brains behind the National Theatre of Brent, whose shows were consistently funny and inventive. Sadly the 39 Steps isn't anywhere near as smart as it would like to think. Instead it's a lampooned run through the 1935 Hitchcock-directed film of the book that comes in at just over one hour and forty-five minutes, which also includes an interval. On the plus side that does make it quite pacy... but once you've got over the fact that just four actors are playing all the characters, and you've worked out where the sight gags and prat falls are coming, and you've stopped laughing at the sub 'Allo 'Allo comedy accents, and you've realised the on-stage costume changes are quite cleverly orchestrated... there's actually not a lot to it. It's West End theatre as done by the Chuckle Brothers, except if the Chuckle Brothers were doing it then it would be done with a lot more affection and the sight gags and the prat falls would be funnier. I was lucky enough to see Knee High Theatre do their version of Brief Encounter a few years ago and that was also part-pastiche, but it also had a real heart to it and you could see the cast and the creative team behind it really cared and respected the source material. Sadly with the 39 Steps the over-riding feeling is that it's a cynical piss-take and the creative team are essentially out to make a quick buck. And, sadly, the product suffers and has a jaded feel to it.